Today, Japanese Olympic Curling Team came to Soka-city. 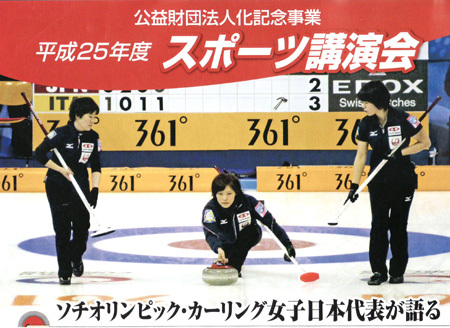 All of them came.It is not long while after the Olympic Games was over, I myself still is in the Olympic enthusiasm,I hardly believed to have them here.As I love curling I was so excited before they appeared on the stage.I saw them, and felt curling game’s tension on the stage.They will participate in Japan title in Karuizawa the next day.I thank you very much for them to be here. they must be tired with attending many welcoming ceremonies.Ms Ogasawara mada a short speech and said the important thing is to have the same dream, same purpose. Thank you for coming! !